Bold in flavor and dense in nutrition, this crunchy-nutty-sassy-savory-sweet meal is a golden delight you will make again and again! 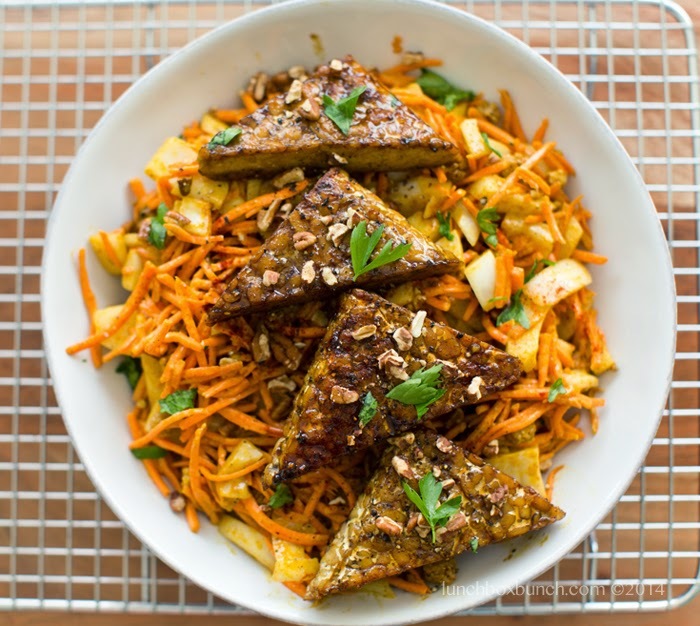 Whip up my Easy Carrot Slaw with Smoky Maple Tempeh Triangles and you'll be swooning over veggies and plant-based protein. This is an easy recipe with cravable flavors. Make-ahead meal approved! This is one of my favorite vegan meals to make. A "go-to" status recipe for sure. I adore it because it is super easy to whip up, bold in flavor and complex textures and even better, if you want, you can make it a few hours in advance, stick it in the fridge and enjoy it when you are ready. Hot or Cold. 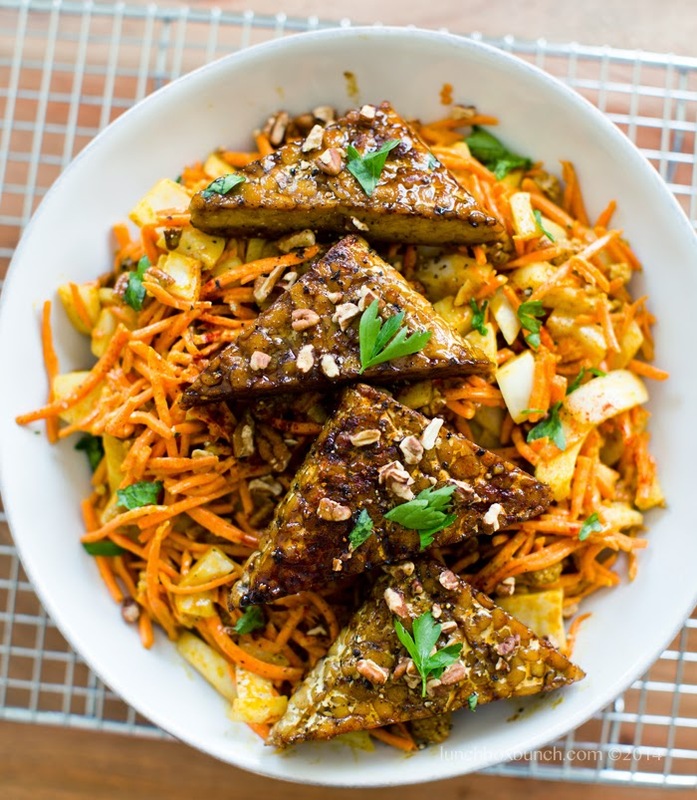 This entire dish, from the slaw to the skillet-seared tempeh is delicious served right away (freshly tossed slaw with steaming hot tempeh) or chilled (chilled tempeh and slaw, both a bit more marinated in flavors). 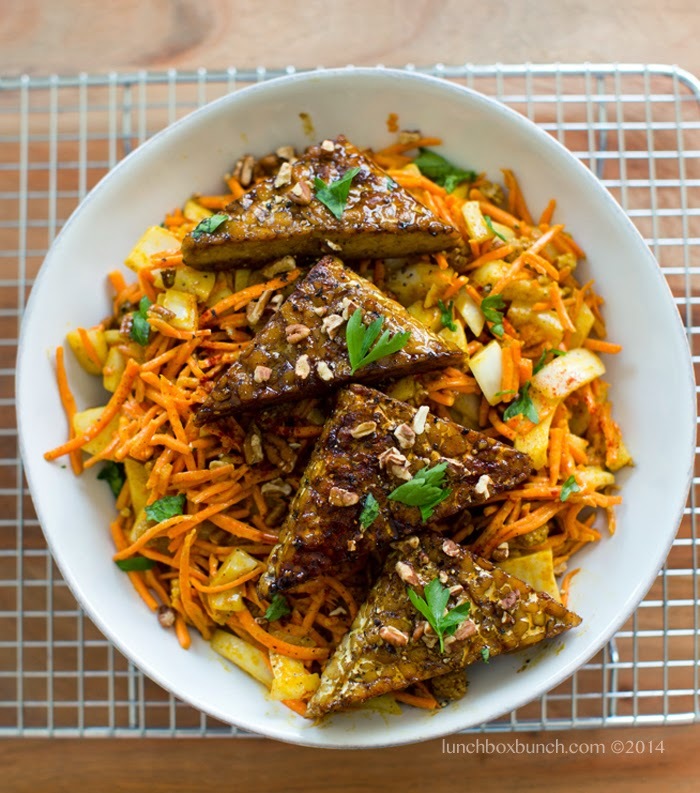 The goods: vitamin A rich carrots are tossed in a light yet bold sweet-tahini-curry dressing, then topped with protein-rich tempeh triangles that are bursting with savory-sweet flavor. This vegan meal is a winner! I hope you will try it and share it with friends in family. Especially those of you looking to experiment with tempeh, aka a fermented soybean product that is less processed than tofu, and has a firm texture and nutty complex flavor. My recipe.. So nice to come back to this kind of food after a long and CRAZY weekend. Seriously guys, I went from Thursday night until Sunday afternoon without stopping. First up was an Emmy Awards gifting suite with my girl Sophie from Philosophie, and then I was a bridesmaid in a wonderful friend's wedding in Malibu! More on both of those events in a later post. Here is a snippet.. 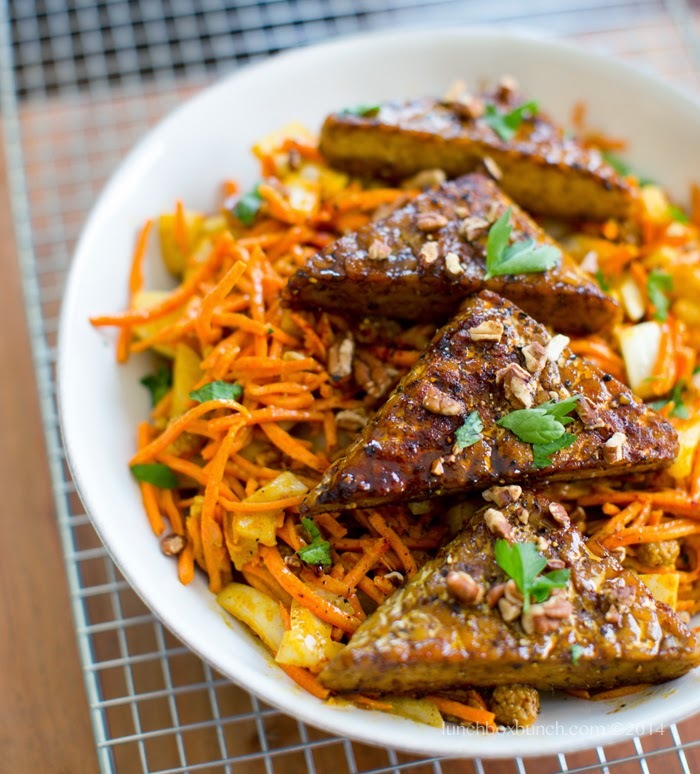 Bold, crunchy tahini and curry dressed carrot slaw meets sticky-sweet smoky-maple glazed tempeh triangles for a vegan meal you will come to crave. Warm a skillet up over high heat and add in the coconut or olive oil. 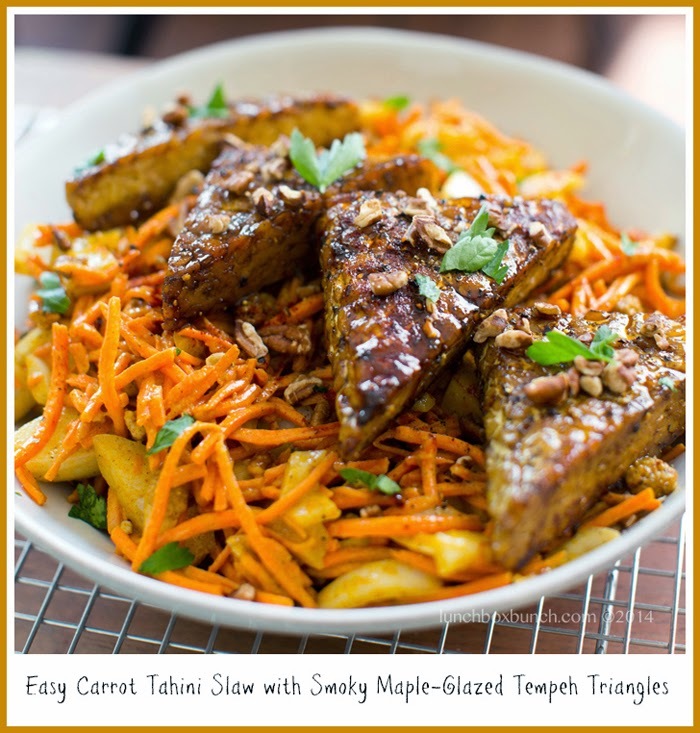 When oil is hot, add the tempeh triangles, tamari, maple and liquid smoke. Flip the tempeh around a bit to allow it to absorb the liquid. Cook for about 5 minutes, flipping the tempeh a few times throughout the cooking process. When tempeh is browned and edges blackened a bit, and all liquid absorbed, turn off heat. Sprinkle the walnut pieces and some black pepper over top the tempeh and set pan aside to keep triangles warm in skillet. In a large mixing bowl, add the carrots, tahini, lemon juice, spices, parsley, maple syrup, optional raisins and onion. Toss very well for a few minutes to marinate the carrots with the dressing. For a creamier salad, add another spoonful of tahini. To thin things out and make the salad zestier, add another splash of lemon juice or a teaspoon of apple cider vinegar. Finally, add salt and pepper to the carrot salad to taste. Pour the carrot salad in a large serving bowl and top with the tempeh. Serve right away or place in the fridge to serve in a few hours or up to a day later. The carrots will soften the longer they set in the fridge.